Formation and Properties of Clay-Polymer Complexes provides a comprehensive account of the reactions between clay minerals and organic polymers. 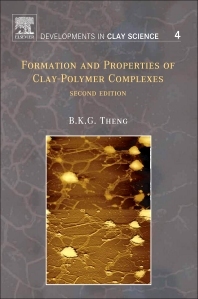 The book opens with a discussion of the structures of common clay minerals, clays colloid chemistry, and the behaviour of organic polymers at clay surfaces. This is followed by a systematic treatment of complex formation between clay minerals and various classes of synthetic and naturally occurring polymers, a description of the properties of the resulting complexes and, wherever appropriate, their practical applications. The book will have a new separate chapter on clay-polymer nanocomposites. Each chapter is written as a self-contained review paper, giving a list of reference to the original literature.